Ontario Carbon Pricing | PRICE CARBON NOW! Finally, in January 2017, Ontario cap-and-trade program got underway, and the first auction was held on March 22, 2017. One hunderd per cent of the 27 milion permits made available were bought by Ontario companies. Each allowance was sold at approximately $18 generating a total revenue of $472 million. This money, by law, is required to be invested in programs to reduce GHG emissions and help families and businesses reduce their emissions. In the previous year, on June 8, 2016, Ontario government released the province's Five Year Climate Change Action Plan 2016 - 2020, which will be funded by the cap-and-trade program. Before this, in May of 2016, the provincial government passed Climate Change Mitigation and Low-carbon Economy Act, 2016 and two regulations. On April 13, 2015, the Ontario government annnounced that it will introduce a cap-and-trade system of carbon pricing. The province will join the cap-and-trade system in Quebec and California. Details are yet to be announced, but let's hope the carbon price is going to be BROAD, EFFECTIVE AND EQUITABLE. We can still write to the Premier, Minister Murray and our MPPs to urge them to support a BROAD (covering all or most of the GHG emitters), EFFECTIVE (meet most or all of the province’s emissions reduction targets for 2020 and 2050) and EQUITABLE (protect real incomes of low- and middle-income families of Ontario) carbon price. 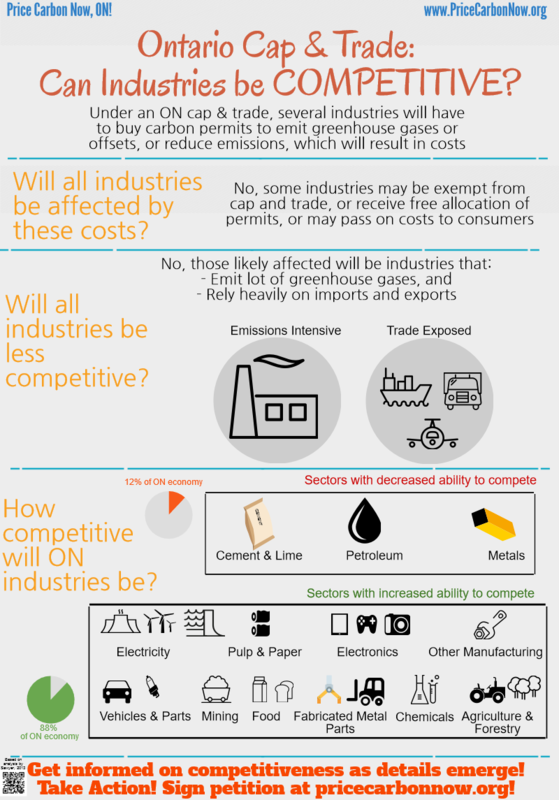 It is especially important now to send a message urging the cap and trade be broad and effective because details are currently being worked out and industries are expected to be lobbying for exemption or receiving free allocation of emission permits (see our infographic to understand how different industries' competitiveness are expected to be affected). Ontario is the most populated province in Canada. Ontario has the second highest amount of greenhouse gas emissions in Canada. Ontario has taken steps to reduce its greenhouse gas emissions, including becoming the first jurisdiction in North America to become coal free. We can do more and have to do more if we are to meet our province's emissions reduction target of 15% below 1990 level by 2020 and 80% below 1990 level by 2050. The most cost-effective, market-based approach to emissions reduction is carbon pricing. Ontario has taken some initial steps to introduce carbon pricing since 2009, including passing cap-and-trade enabling legislation in 2009. However, further progress has been limited. We need to design and implement a carbon pricing system quickly because the more we delay, the larger the cost of emissions reduction. As proud, progressive residents of the province we need to act by urging our government to quickly design a broad, effective, equitable and sustainable carbon pricing system and implement it. Lets make Ontario a leader and a model for others in pricing carbon effectively!